Adipose-derived stem cells (ASCs) are multipotent mesenchymal progenitor cells that have functional and phenotypic overlap with pericytes lining microvessels in adipose tissue. The role of CD140b [platelet-derived growth factor receptor-β (PDGFR-β)], a constitutive marker expressed by ASCs, in the angiogenic behavior of human retinal endothelial cells (HREs) is not known. 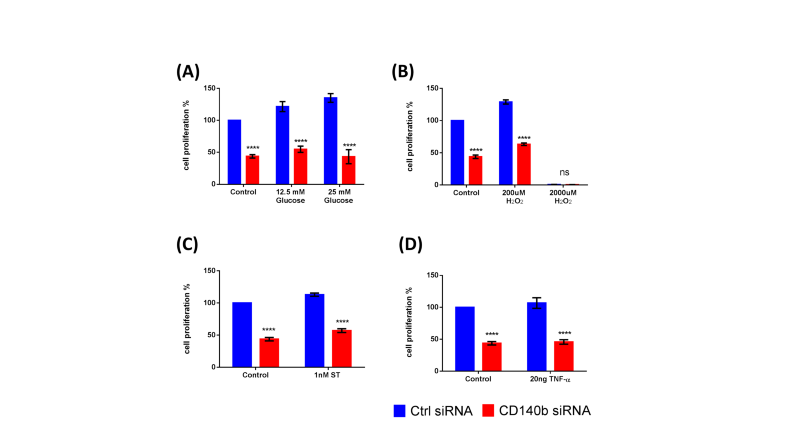 CD140b was knocked down in ASCs using targeted siRNA and Lipofectamine transfection protocol. 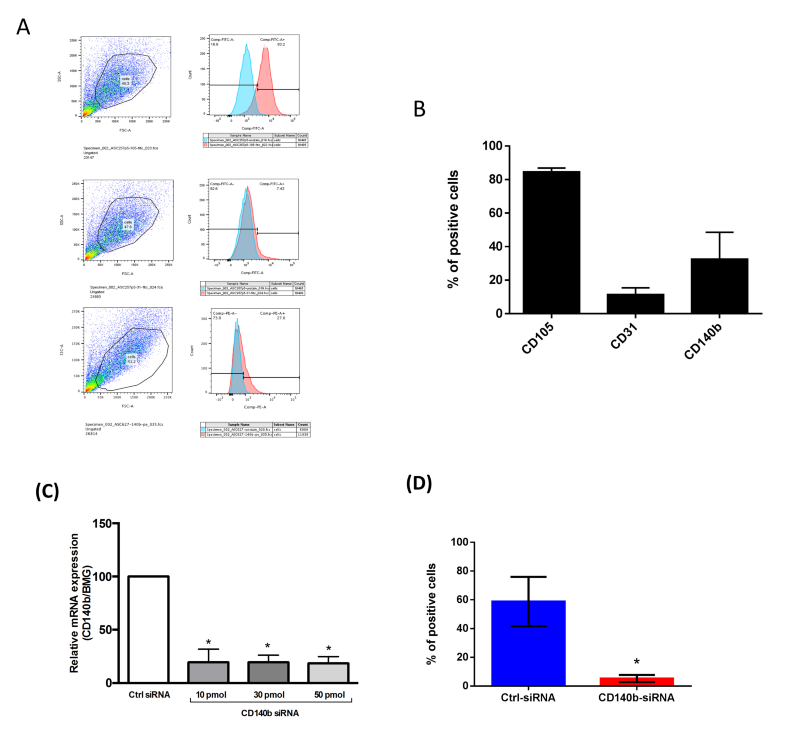 Both CD140b+ and CD140b− ASCs were tested for their proliferation (WST-1 reagent), adhesion (laminin-1-coated plates), and migration (wound-scratch assay). Angiogenic effect of CD140b+ and CD140b− ASCs on HREs was examined by co-culturing ASCs:HREs in 12:1 ratio for 6 days followed by visualization of vascular network by isolectin B4 staining. The RayBio® Membrane-Based Antibody Array was used to assess differences in human cytokines released by CD140b+ or CD140b− ASCs. Knockdown of CD140b in ASCs resulted in a significant 50% decrease in proliferation rate, 25% decrease in adhesion ability to laminin-1, and 50% decrease in migration rate, as compared to CD140b+ ASCs. Direct contact of ASCs expressing CD140b+ with HREs resulted in robust vascular network formation that was significantly reduced with using CD140b− ASCs. Of the 80 proteins tested, 45 proteins remained unchanged (> 0.5-–< 1.5-fold), 6 proteins including IL-10 were downregulated (< 0.5-fold), and 29 proteins including IL-16 and TNF-β were upregulated (> 1.5-fold) in CD140b− ASCs compared to CD140b+ ASCs. Our data demonstrate a substantial role for CD140b in the intrinsic abilities of ASCs and their angiogenic influence on HREs. Future studies are needed to fully explore the signaling of CD140b in ASCs in vivo for retinal regeneration. Adipose-derived stem cells (ASCs) obtained from human fat can differentiate into multiple tissues and also exhibit features of pericytes. In this study, we addressed the role of CD140b, a surface protein in ASCs that serves as a pericyte marker in angiogenic functioning of retinal endothelial cells. Our results demonstrate that CD140b is not only required for ASC survival but also mediates the production of certain paracrine factors that positively affect the angiogenic properties of retinal endothelial cells. Our study paves the way for future studies that are needed to fully explore CD140b signaling in ASCs in vivo for retinal regeneration. Long-term studies are needed to study the safety and effectiveness of CD140b+ ASCs in retinal disease models to rule out any complications of stem cell treatment, including potential rejection and need for reinjection. Ramesh Periasamy and Sally L. Elshaer contributed equally to this work. 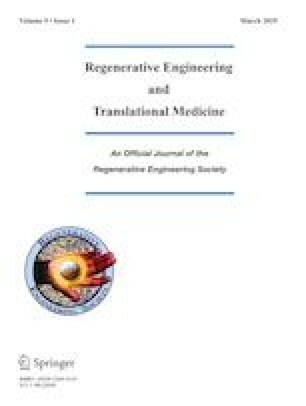 The online version of this article ( https://doi.org/10.1007/s40883-018-0068-9) contains supplementary material, which is available to authorized users. Authors wish to acknowledge Jack Anderson, BS, for technical support and Daniel Johnson, PhD, for the help with statistical analysis. Conceived and designed the experiments: RP, SLE, RG. Performed the experiments: RP, SLE. 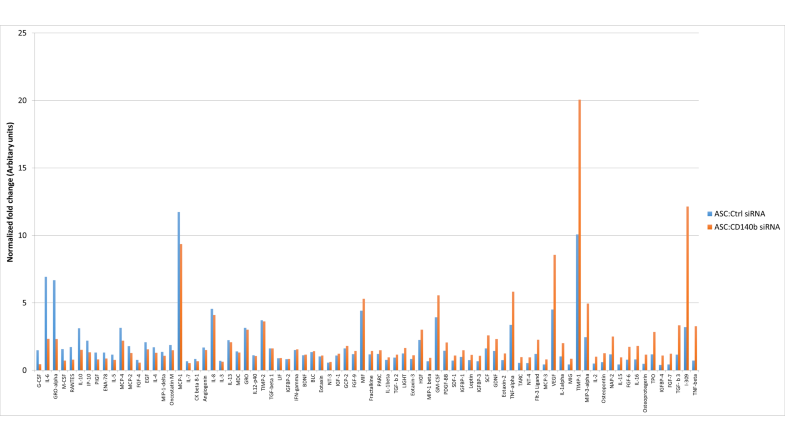 Analyzed the data: RP, SLE, RG. Wrote and reviewed the paper: RP, SLE, RG. Conceptualization and final approval: RG. This study was funded by grants from National Eye Institute (EY023427) and unrestricted funds from Research to Prevent Blindness to R.G. Human ASC culture studies were approved for research per the University of Tennessee Institutional Biosafety and Institutional Review Board as exempt study. RG is a co-founder and hold equity in Cell Care Therapeutics Inc., whose interest is in the use of adipose-derived stromal cells in visual disorders. None of the other authors declare any financial conflicts.